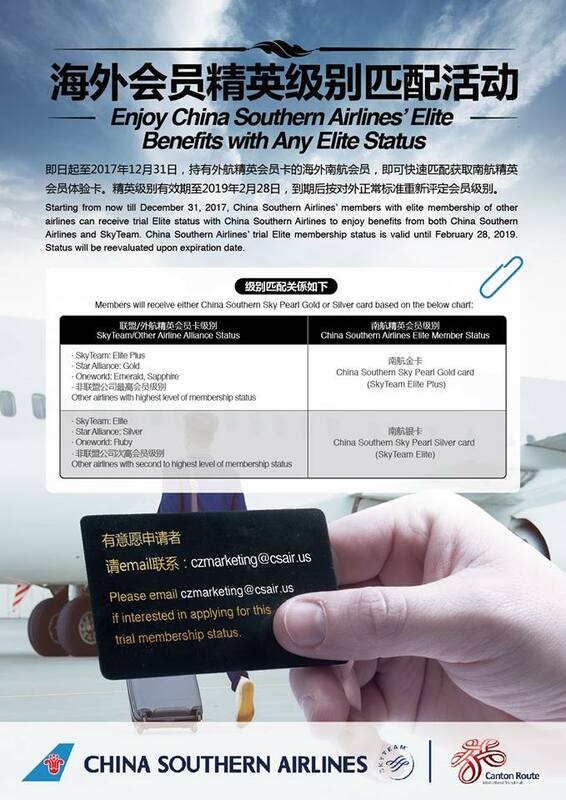 China Southern Airlines marketing department in the U.S. has announced a Status Match promotion for their SkyPearl frequent flyer program which can give you SkyTeam Elite Plus status until 2019. SkyPearl Eilte Status comes in two versions: Gold (SkyTeam Elite Plus) and Silver (SkyTeam Elite) which both have significant benefits on China Southern itself and of course on alliance partners. 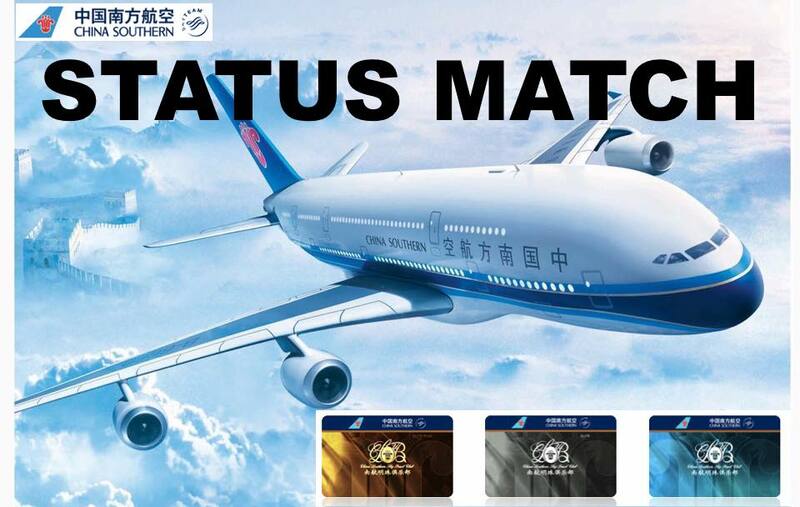 Should you get approved for this Status Match in the China Southern SkyPearl Program it is an excellent way to secure SkyTeam Elite Plus Status which comes with Lounge Access and many other benefits including additional baggage allowance and preferred seating on China Southern flights . To proceed with this status match you have to either enroll a new account with SkyPearl or use your existing one. This promotion is advertised publicly on China Southern’s Facebook account (see here) so it’s completely legitimate. If you are an elite member of any other airline, you can now enjoy our Elite Benefits as well! Email czmarketing@csair.us to inquire! So from the flyer above it seems that China Southern pretty much matches any program under the sun and with a very generous expiration date of the trial status (February 2019). This promotion comes from China Southern North America so I’m not sure if you need a North American address. It doesn’t say so but you never know and if you have one at your disposal it can’t hurt to add it to your account. At least until the match application is processed. Star Alliance Gold, OneWorld Emerald/Saphhire and even competing SkyTeam Elite Plus programs will receive SkyPearl Gold Status that comes with SkyTeam Elite+ which includes lounge access on SkyTeam airlines. SkyPearl Silver still gives lounge access on China Southern itself for the traveler (no companion) and SkyPriority benefits on partners. I signed up for a new account, however this requires a verification code by SMS to be sent to your mobile phone. There might be some issues depending in which country your cellphone is registered. My German phone number worked but both my Hong Kong and Thailand number which I tried before did not. The status match promotion aside I actually like China Southern. They fly many new aircraft especially on long haul routes so if you select carefully you might really have a good experience flying on them. They also offer a good network within China, however the aircraft on domestic flights can be very old at times. A great way to obtain Elite Plus Status with significant benefits on China Southern as well. I haven’t had SkyTeam status for quite some time after the Alitalia Match ran out, simply due to me preferring Star Alliance and oneWorld. However I occasionally have some Korean Air and China Airlines flights so this will come handy since I need an account to credit these miles to either way. For those of you flying Delta in the U.S. be aware that Delta does not grant lounge access with a solely domestic ticket even if you have SkyTeam Elite+ Status – international itineraries are ok though.